Manually installing the signature database for Spyware Doctor is easily done using the Signature Database Transfer Setup tool. Check this guide to manually installing Spyware Doctor updates. PC Tools Spyware Doctor includes a Smart Update component that will check and download available program and database updates. However, there are people who couldn't update the program due to malware infection, or the computer with Spyware Doctor program is not connected to the Internet. Some Internet users are connected using a dial-up connection which means they prefer to deploy the update to other computers without the need of re-downloading the file. Manually installing Spyware Doctor updates can be done with the help of a Signature Database Transfer Setup Wizard provided by PC Tools. Read on to learn how you can install or transfer the database of Spyware Doctor in Windows 7, Vista or XP. You can download the signature database of Spyware Doctor, Spyware Doctor with Antivirus, PC Internet Security, and Spyware Doctor with Antivirus Starter Edition using a computer with or without PC Tools program installed. Execute the file to start downloading the available and current database updates for Spyware Doctor. The database download setup will download the necessary files by creating a Databases folder, and it will be stored in the location where you run SDDB7.0.0.exe or SDDB8.0.0.exe. Now that you've download the database for Spyware Doctor or PC Tools Internet Security program, all you need to do is to install the database using DBTransfer.exe, which is the Signature Database Transfer Setup tool. 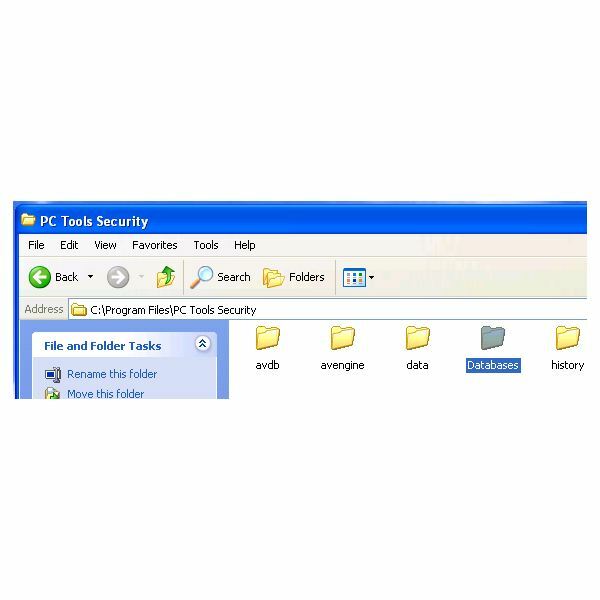 Exit Spyware Doctor or PC Tools Internet Security: Right-click the notification tray icon of the program and click Shutdown. 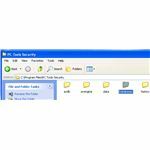 The program will end the running PC Tools processes: PC Tools user interface and services. Open Databases folder and double-click DBTransfer.exe that will start to manually installing Spyware Doctor updates in a computer with PC tools software. The Signature Database Transfer Setup Wizard will be displayed. Click Next to install the detection signatures. Launch Spyware Doctor or PC Tools Internet Security program. The signature database is now installed which you can use to scan Windows or any local drives connected to the computer. Note that you can use the same steps to manually install the database of Spyware Doctor to other computers at home. The database is updated on a daily basis, which means you need to download SDDB7.0.0.exe or SDDB8.0.0.exe again to get the current or new signature database. 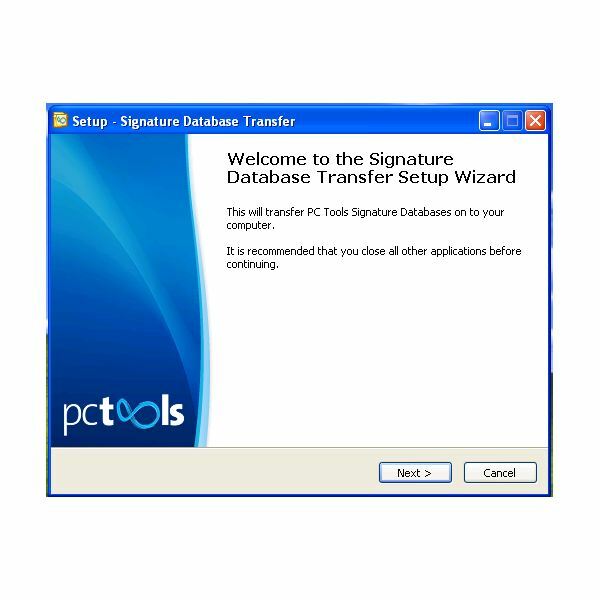 The Signature Database Transfer Setup tool of PC Tools only installs the virus and malware detection signatures. It will not download or install program updates e.g. new versions or new builds of PC Tools program that may have new features or program fixes and improvements. Visit the software vendors' website to determine if you have the current product version. The Smart Update tool in PC Tools program can download product and database updates. Browse for refdb_tmp and refdb.bin6 files in C:\Program Files\PC Tools Security folder. Delete both files, if they exist. Open the Databases folder and execute DBTransfer.exe again to manually install the database again. Restart the computer after using the Signature Transfer Setup tool. The program should now have the new database and the pop-up notification that an update is required will no longer display.